Those tennis fans in India who didn't stay up till past two in the morning on 12 July, woke up to good news. And those awake witnessed an exhilarating doubles final. Four years ago, at the French Open, Sania Mirza and her then partner Elena Vesnina lost the final 4-6, 3-6. Fast forward to 11 July, 2015, Mirza partnering Hingis at Wimbledon, faced her old partner Elena Vesnina with Ekaterina Makarova. 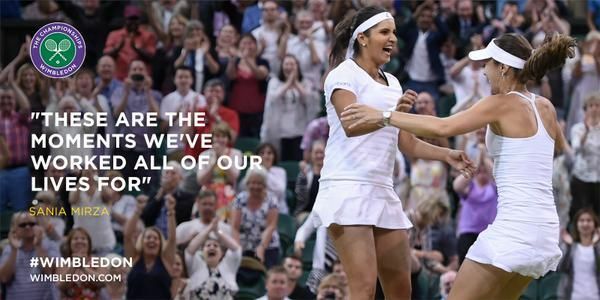 Mirza, 28, and Hingis, 34, came from a set down and 2-5 in the third to beat the Russian pair and won the Wimbledon doubles Grand Slam title. They won five straights games to seal the championship. The match lasted two and a half hours on Centre Court. Hingis had to wait 17 years - half her life - to add to her three Wimbledon titles. This is Mirza's first ever Women's Doubles Grand Slam title. She has won three mixed doubles Grand Slam titles though. For Hingis, this is her first Wimbledon title since 1998. Having decided to play together in March this year itself, Hingis and Mirza have been on a roll. The duo has won three WTA titles, and now a Grand Slam. For much of the match, it looked like the number 1 seeds would lose. The number 2 seeds, Vesnina-Makarova, were dominant and unforgiving. Makarova served faultlessly until 5-3 in the third set when her serve gave way. "I have a great partner to pull me through," Hingis said after her latest triumph. "It takes guts and courage being 5-2 down in the third set. Couldn't have asked for more drama." The final had been halted at 5-5 due to fading light. This was done to allow the roof to close and lights to come on. When play resumed, Hingis and Mirza wasted no time. They broke in the 11th game of the deciding set. "To come out here at Wimbledon, this is something we dream of as kids," said Mirza. Mirza will go back home to India with her head held high. Hingis, however, will not get time to rest. On 12 July, she and her mixed doubles partner Leander Paes will battle it out in the finals. Hingis has never won the mixed doubles title at Wimbledon and this could be her best shot.